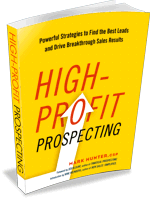 Too many salespeople slow down with their prospecting as the end of the year approaches. This is so short sighted! You need to ramp up your prospecting efforts now through year end. You will likely discover that the holidays cause schedule variations that actually offer you MORE opportunities to reach people. And be sure to use the phone often in your prospecting efforts. You’ll be surprised that in some cases it is easier to reach your prospects.